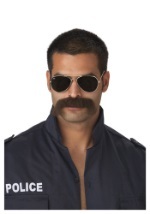 You'll be a suave 70's private investigator in our detective costume kit. The funny investigator kit includes a pair of dark, aviator style sunglasses, a wavy brown costume wig with comfortable mesh and elastic interior lining, a brown mustache with self-adhesive on the back, and a silver embroidered police badge with a holder (Please note: the badge is silver and embroidered which varies from the picture). Become your favorite retro television P.I. with this detective Halloween costume kit!